"I was standing outside in what looked like a prairie and I could see a huge volcano in the distance. The volcano looked imposing and yet beautiful and majestic. As I was enjoying myself in the sunlight the volcano began to release dangerous looking puffs of smoke as if it was getting ready to erupt. As I continued to watch the volcano, the earth beneath my feet began to shake violently and I saw the volcano began to erupt. It was more like a massive explosion and it began to spew large amounts of dirt, fire and ash into sky. Although the volcano was very far away, the earth under my feet began to shake and vibrate so violently that I could not remain standing any longer. As I watched this volcano erupting, I remember thinking that I had never seen such a violent eruption and such a great earthquake take place in my life before; I said this is the big one" Then I woke up. A large volcano is going to erupt in the very near future that will cause a massive earthquake that will be felt very far away and cause great devastation. I am not sure where this earthquake was located, but I believe that after this volcano erupts, others will follow in many parts of the world including the United States. They are going to begin to go off like firecrackers one after the other in quick succession. This eruption will be so big, that it will be felt in many parts of the world. The ash and smoke from these events could cause the sun to be darkened. 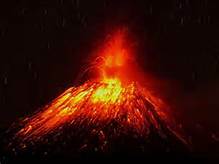 Recently while checking the news, I came across a photo of Anak Krakatoa and I remembered it was the same volcano I had seen in my vision of the night. When this volcano erupts, it will trigger the entire Ring of Fire in the entire Pacific Region.